Autism Queensland Mackay Team Leader Ann-Marie Watson had the pleasure of accepting this sizeable cheque on behalf of Autism Queensland from Cooktown Crusaders founders Peter Sheppard and Les Wildman. These wonderful gentlemen, along with 11 other riders, braved wet weather and treacherous conditions from June 6-21 to ride from Brisbane to Cooktown to raise funds and awareness for autism. 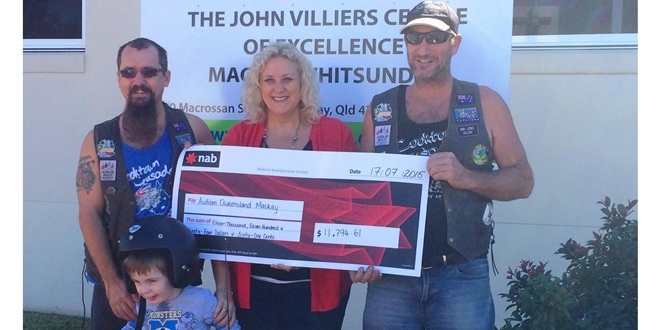 AUTISM Queensland recently received an $11,774 donation from the Cooktown Crusaders who raised the funds in June via their annual 4572km Brisbane to Cooktown Ride for Autism. Now in its third year, 13 riders braved wet weather and treacherous conditions over 16 days from June 6-21, 2015 to raise funds and awareness for autism. Cooktown Crusaders founders Peter Sheppard and Les Wildman presented the cheque to Mackay team leader Ann-Marie Watson, who accepted the donation on behalf of Autism Queensland. “My son Blair has autism and is my inspiration to help families like mine who struggled with getting information and the support they need,” Peter said. “We raised $5000 on last year’s ride, so we’re really happy with the effort everyone put in this year. “The weather was really terrible so we didn’t get as many riders as we’d hoped, but we’re still happy with the result. “We couldn’t have done it without the support of our sponsors: DMC Haulage who helped fund our merchandise, CC Haulage who kicked off this year with a sizeable donation and Jackson’s Parts N Industrial Supplies and Chris’s Welding and Steel Chinchilla who sponsored our trailers. “We also received support from Stagg Leathergoods and Offshore Signs & Screenprints Mt Coolum who designed our logo and signage. Ann-Marie thanked Peter, Les and all the people who participated for the donation and said the children had been delighted with their visit during the ride. 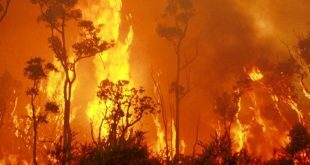 “Some of the Mackay team and families went down to have breakfast with the Crusaders before they left Sarina and I asked them to come through to the centre on their way back,” she said. “One of our students got to write his name on one of the bikes and was very excited about it all. Autism prevalence in Australia is on the rise, with the condition now more common than cerebral palsy, diabetes, deafness, blindness and leukaemia put together. In Queensland, over 10,000 school-aged children are living with autism. Autism Queensland runs Queensland’s only autism-specific schools at Brighton and Sunnybank, as well as early intervention centres in Brisbane, Rockhampton, Cairns, Mackay and Gladstone. Its outreach teams visit all schools in Queensland as well as providing support in the home. Visit www.autismqld.com.au for more information.